Harry had wanted to fill in the breaks between his regular visits fishing for Salmon in Scotland. He wanted to brush up on his skills and take a look at my methods and trotting tackle for dace chub and roach. So we met last week on a beautiful cloudy mild winter day on the Bristol Avon. The river was running very clear and low making it perfect for trotting, remembering my saying low and clear the chub are here. As we arrived at the swim the first thing I showed Harry was where the chub would lay near to some cover and snags. It was obvious really. The next thing I did was to start feeding the swim with about 20 red maggots every minute or so via a catapult. The swim was not very deep at about 3ft and there was sufficient flow for the float to drift through at about walking pace. Perfect! Whilst I showed him the tackle and the light line it was here where he started to learn some lessons. We set up a nice little stick float of 4 bb and I showed how to set the shot at different heights on the main line for shallow and deeper swims. While this was going on we continued to feed the swim. Soon all was ready and guess what like clockwork the first trot down resulted in the float going under near to an overhanging branch the strike met with a good resistance from a small chub of about 1.5lbs. Harry had great fun playing and landing the chub on such light line. I should think it couldn’t be further from salmon fishing. We continued feeding the same area and sure enough there must have been a shoal of them there as a few more chub came his way. I think we can say he was enjoying himself.There were no monsters here 2.5lbs being about the largest. however great fun on the light tackle and great for learning how to control the 15ft rod and light line. Having caught 4 or 5 chub from the swim plus a couple of small brown trout we decided to rest it for a while. We moved downstream to another likely looking swim but failed to raise anything from it. The third swim proved to be very difficult to trot due to the sunlight that was burning away the clouds reflecting on the river’s surface. 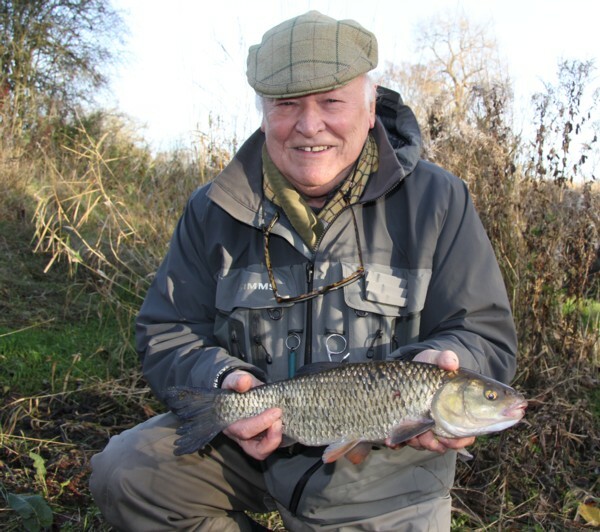 However we did manage another small chub of a couple of pounds.By now it was almost lunchtime and we decided to move way upstream to a much deeper stretch of 10-12ft. 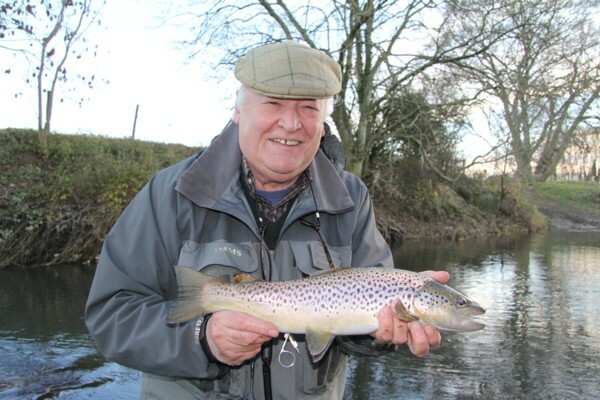 Here the flow was minimal and after a few trots through decided to move back stream and try our luck again where we had a few fish.Again we fed with maggots before we cast out again…….bingo first trot down the float went under and soon Harry was playing yet another chub. He was in full swing now and you could tell that he was much more confident with all aspects of his trotting skills. 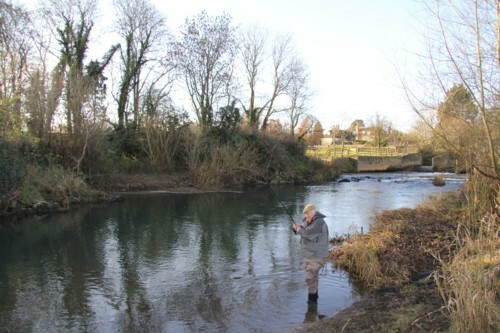 However we hooked and lost another chub shortly after and that was it from that swim.A move further downstream did yield a small dace the faster water didn’t give up much else. So time was moving on and for the last hour we fished a swim that looked promising.First thing I did was to say to Harry watch out it’s slippery down hereeeeeeeeeeeeer as the legs went up and I went down. Harry though was much steadier coming down, and managed to control his laughter!Soon Harry was searching the swim really well and hooked I think 2 trout one being particularly pretty. For the last 30 minutes Harry’s back was being tested and he asked me to have a fish. Well I think I had one trout and a couple of chub as the fish seemed to come onto the feed.The day though had been a great success and Harry had caught 10 chub 7 trout and a dace. 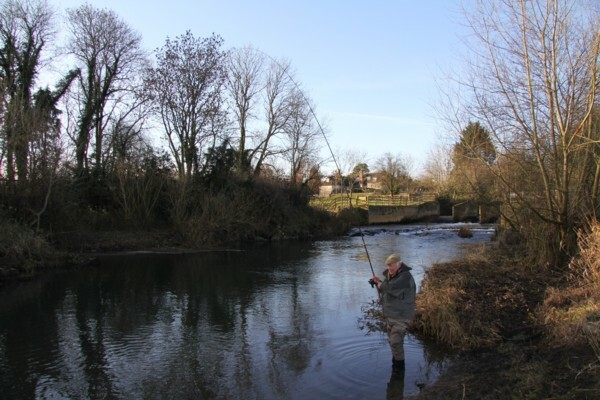 It was a pity we couldn’t find the dace shoal but that will wait until next time. I kept asking Harry what he had learnt. 3. Keeping control of the float and line as it goes down the stream. This entry was posted on Tuesday, December 10th, 2013 at 10:34 pm	and is filed under Uncategorized. You can follow any responses to this entry through the RSS 2.0 feed. Both comments and pings are currently closed.